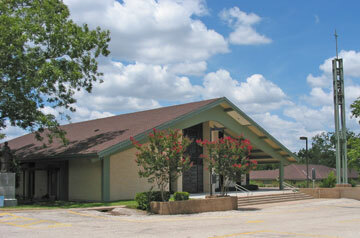 St. John the Baptist Catholic Church is one of the earliest Czech Catholic churches in Texas. It is a valuable repository of Czech genealogical records that I am excited to use. Many Czech and German immigrants settled in this area in the mid-1800s. After many years without the services of a Czech-speaking priest, the Czech community sent Konstantin Chovanec and John Vychopen to ask Galveston Bishop Claude-Marie Dubuis for help. Encouraged by Dubuis, the Czech community organized St. John the Baptist Catholic Church and erected a sanctuary in Fayetteville in 1870. The Rev. Joseph Chromcik arrived on Christmas day in 1872 to minister at St. John Baptist Church and became the first Czech-speaking priest in Texas. The church prospered and in 1875 the Chromcik School was opened. A mission church was established in nearby Warrenton in 1886. Chromcik extended his missionary work throughout the region and remained in Fayetteville until his death in 1910. A new sanctuary was erected in 1911 and a new 2-story school built in 1915 during the pastorate of the Rev. John Vanicek. A convent for the Sisters of Divine Providence was built in 1964. A new sanctuary was erected in 1969, and a parish hall, educational center, and other facilities were added over the years. St. John the Baptist Church is representative of the area’s Czech heritage and continues a tradition of leadership in the region’s Catholic community. I called 979-378-2277 and spoke with Ms. Mary Babin. She is one of two people who do genealogy look ups at St. John’s. She said that they have the baptism, marriage, and death/burial registers from the beginning of the church’s founding in 1870, as well as all of the registers for neighboring St. Mary’s. Patrons are not allowed to handle the registers themselves. She said that when doing look ups she sometimes has difficulty because they are written in Czech; she said that she can take a picture (or make a copy?) of the individual page and get them to me. I do not know if this is via email or snail mail. When I find out, I will post more about this. She said that they only ask that patrons give a small donation to compensate for the time and effort spent in locating the records. It is a voluntary donation but (when pressed) she said $10-20 is customary, depending on the number of records searched. Because they are volunteers, and this is not the most pressing matter on their agendas, it is important to be patient with them. The look ups can generally be done in a matter of weeks. I will also post how long it takes once Ms. Babin gets back to me. She was quite friendly and cheerful. I’m looking forward to looking at the records she finds for me. Hey. I had no idea you were up to all this work. Great little tips!